Karen Kisslinger was a brilliant teacher and an ardent champion for changing our world for the better. In her will, she requested that a fund be set up to benefit students who show a propensity for the values that Karen was so passionate about. 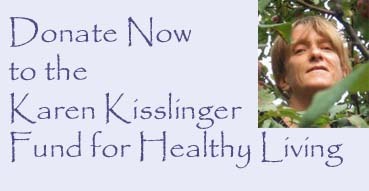 The Karen Kisslinger Fund for Healthy Living is a unique charitable resource established by Karen’s family to continue her legacy of health in body, mind, spirit, and community. Karen was a healer, teacher, writer and artist who had a broad impact on her community. Once the fund has grown an endowment, it will grant yearly scholarships to students who have demonstrated an interest, skill, and passion for one or more of the ideals and practices Karen taught about and lived by. In today’s world there is an ever-growing need for people who are committed to balanced lifestyles, sustainability and health. A donation to the Karen Kisslinger fund will allow others the opportunity to study integrative practices as Karen did. The fund will provide support for students studying or plannning to study alternative or community health, organic agriculture and sustainable growing, yoga, meditation or other contempletive arts, or socially engaged spiritual practices.